There are several stuffed chicken recipes out there, but this one is special. 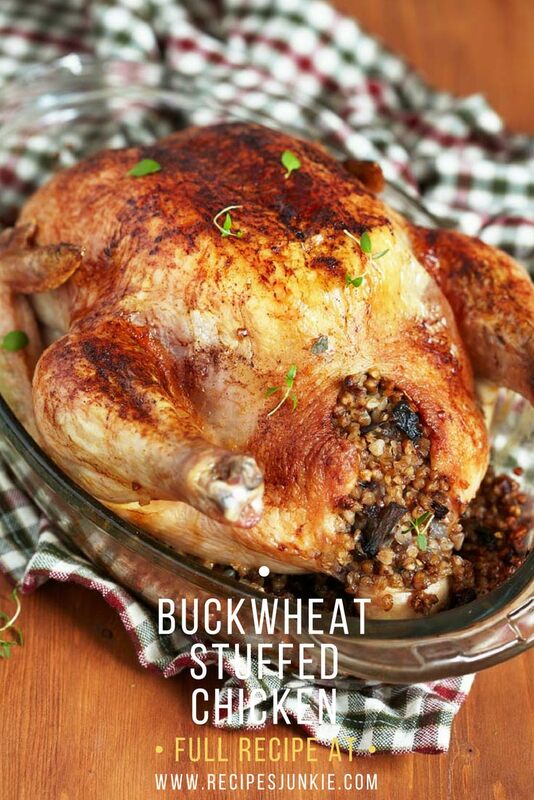 What makes this recipe special is that this stuffed roast chicken is stuffed with buckwheat. If you have guests coming over for a dinner, then this is a perfect dish to make. This dish is great to make if you have company as it is best enjoyed with large number of people. The dish tastes delicious and the presentation is just beautiful. If you fancy a gluten free dinner, then this stuffed roast chicken recipe is ideal. There are many different ways to roast the chicken, but the best method would be that which will help keep the meat moist for a longer duration. These are many of the methods to keep the roast chicken moist and tender. If the bird is small, then roasting the bird fast is a nice way to achieve best results. This ensures the bird is cooked fast especially on weeknights. Whenever you buy chicken make sure all the birds are of same size and weight, so that you know exactly how long it will take to roast the chicken. If you have more guests coming over, then add few more birds and any leftovers can be used to make sandwiches and stir-fry next day. • Put the buckwheat in a saucepan with 1 ½ cups of water. Bring this to a boil and continue to cook this on a medium heat until all the water has evaporated. At this point check if the buckwheat groats are cooked well, this will take about 10minutes. Make sure you don’t overcook it as it can turn mushy. Take this off the heat and allow it to cool. • Dice the mushrooms, bacon, leek, garlic and thyme leaves. Keep these ingredients ready. • Fry together all the above ingredients along with the thyme leaves until they are golden brown. Mix these with the cooked buckwheat groats and balsamic vinegar and season them well according to taste. Your stuffing is now ready. • Preheat the oven to 180 degree C.
• Stuff the chicken with the stuffing and seal the ending with a toothpick. Place this on a roasting pan and drizzle with olive oil, salt and pepper. Cut the lemons into half and place them around the chicken. 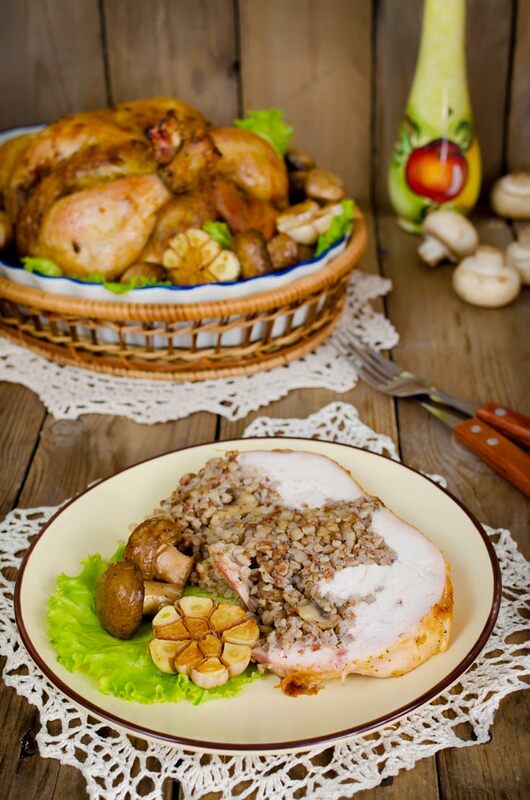 • Roast the chicken for about 70-80 minutes in the oven. Prick the meat between the leg and body of the chicken. When you find clear juices running down, then you can be sure the roast chicken is done. • Allow it to rest for 15 minutes before you cut out the meat. While serving squeeze the roasted lemons onto the chicken. This becomes your instant lemon sauce. Give yourself about 45 minutes to prepare and another tip would be to cook the buckwheat groats the day before as freshly cooked buckwheat tends to be delicate and mushy. The best part of this stuffed roast chicken recipe is that you have two meals in one dish. The side dish is cooking inside the main. The other benefit of making this stuffed chicken dish is that it is easy to cook, serve and clean up too. So, go ahead and plan a stuffed chicken dish this weekend and see your guests enjoying your roast chicken.